The ill bird loses body heat very quickly when it stops eating, as the energy reserves are depleted by illness. By re-establishing the normal body temperature and blood sugar levels, most lives are saved. Heat of 35 degrees Celsius is needed since the normal body temperature of the budgerigar is 42 degrees Celsius. The internal body core temperature is most quickly elevated by a heated energy source (ER formula) administered directly into the crop. For example, budgerigars, 3mls of ER formula of maple syrup consistency and heated to 35 degrees Celsius is given to budgerigar-sized birds using an 18 gauge crop needle. The bird is then placed into a quiet, heated hospital cage. Clean paper is used on the floor to monitor and collect droppings. Fresh food and water is given, but grit, sand and other foods are removed until recovery is complete because the ill bird often over-engorges on grit and then obstructs the gizzard causing death. 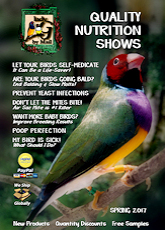 ER Formula - abandoned/orphaned and sick birds that stop eating because of illness can be saved when ER Formula is given. 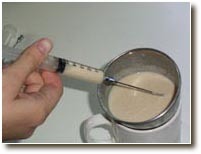 A syringe and crop needle should be used for crop feeding. In between feeds, boil the utensils, etc., so as to prevent any food spoilage and subsequent infections. The utensils are soaked in a Water Cleanser after cleaning. The ER formula must be made fresh and the leftovers discarded. Fill the medium-sized bowl with hot water. Into the small cup, add 1 spoonful of ER formula. Hold the small cup in the larger bowl so that the hot water keeps the formula warm. Adding a couple drops of hot water from the tap at a time, use the butter knife or back of the spoon to mix the powder into a paste. Use the knife or spoon to squash the formula against the side of the cup to smooth out all lumps. Continue adding a couple drops of hot water at a time until the formula is the consistency of maple syrup. 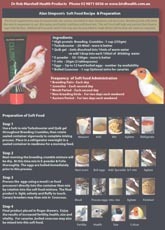 Have the bird nearby, but not in the preparation area, as the water and ER formula must remain hot when fed to your sick bird. It is best not to make the formula in the microwave. Mix by hand with the hot water and double check the temperature before feeding. 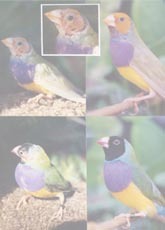 Continue feeding for one day after the bird is seen eating seed on its own. Always lubricate the crop needle prior to use. A small amount of oil or Vaseline helps the tube to slide into the fragile and often dry oesophagus. Make the ER formula very warm and fresh each meal. 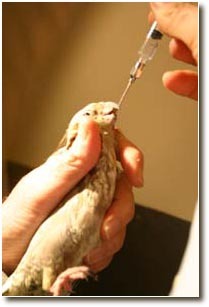 Pre-warm the syringe and needle. Use hot water and not a microwave to heat the formula, as this avoids “hot spots” that burn the crop lining. Clean and disinfect the crop needle and feeding syringe with the Water Cleanser after every feeding. Extend the neck as the needle is slowly introduced from the right side of the beak into the left side of the back of the mouth. The crop needle is then passed gently into the crop. Check it is in the crop by feeling for the crop needle through the skin on the outside of the crop. Now slowly inject the formula into the crop. Fill the crop with the formula. 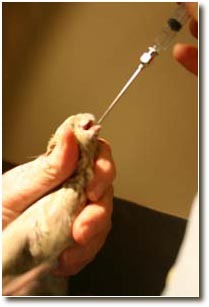 Stop when the tongue moves in a swallowing motion and then quickly but gently remove the needle. Medication may also be mixed into the ER formula. 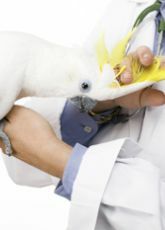 Immediately return the bird to the heated hospital cage.